Quadbar customers range from Government departments, large corporations, farming families, mining, training institutions and tourism destinations. Feedback from customers has been extremely positive. Some examples are provided below. "The Quadbar Crush Protection Device is a MUST for any intelligent quad bike rider. As the Off Highway Vehicle Officer for Parkland County Enforcement Services I never go out riding without it. Parkland County is situated on the western outskirts of Edmonton, Alberta. Parkland County is an off highway vehicle friendly community and provides residents the ability to operate off highway vehicles throughout the county through a bylaw allowing for the use and operatio of OHV's. The use off highway vehicles (OHVs) for recreational purposes can be a lot of fun, but does have the potential for personal injury, or even death. 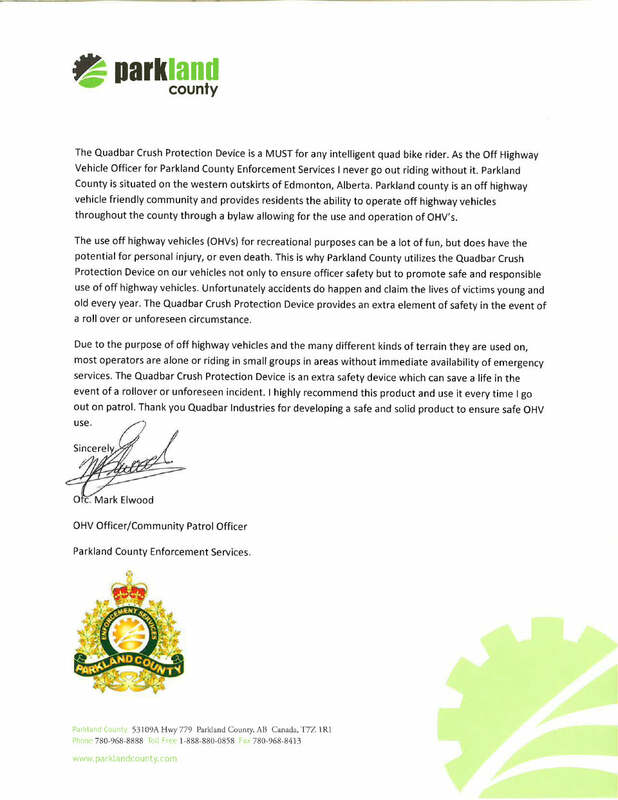 This is why Parkland County utilizes the Quadbar Crush Protection Device on our vehicles not only to ensure officer safety but to promote safe and responsible use of off highway vehicles. Unfortunately accidents to happen and claim the lives of victims young and old every year. The Quadbar Crush Protection Device provides an extra element of safety in the event of a roll over or unforeseen circumstance. Due to the purpose of off highway vehicles and th emany different kinds of terrain they are used on, most operators are alone or riding in small groups in areas without immediate availability of emergency services. The Quadbar Crush Protection Device is an extra safety device which can save a life in the event of a rollover or unforeseen incident. I highly recommend this product an duse it every time I go out on patrol. Thank you Quadbar Industries for developing a safe and solid product to ensure safe OHV use." I purchased a quad bike about a year ago and after about 10 min I realised all the stories about them being dangerous were right as they were prone to tipping over. We use the bike for farm purposes and some times one of my 3 boys also rides the bike around the farm as well. I had to put a stop to them riding it when I saw what happened to a mate when the bike rolled on him and crushed his pelvis. I saw one of your Quad bars on a bike in Brisbane and purchased one while there, since installing the “Quad bar” all my kids have been riding the bike and I finally feel at ease. A few weeks ago I was going down a hill on the bike when it rolled, the bike rolled 2 or 3 times and I was thrown under the bike with the bike coming down on top of me. Lucky for me the 'Quad bar' took the total weight of the bike leaving a space under the bike where I was laying. I come out with a few scratches but nothing in comparison to what would have happened if the bike would have rolled on me. I feel Australian standards’ should be reviewed considering your quad bar or something similar should be fitted to all quad bikes to ensure they improve safety of these bikes. "Tangalooma Quad Tours is one of our most popular activities at the Resort, operates 365 days a year and employs up ot seven full time guides, five casuals and two other support staff indirectly in the department. Tangalooma Island Resort operates the largest tourist based Quad Tour hire fleet in Australia and had trailed a Quad Bar sourced from QB Industries on a 250cc Honda quad after reviewing the product on the company's website and speaking to the Managing Director, Mr Dave Robertson on its suitability for Tangalooma Island Resort and its unique situation. We trialled this product after a meeting with the Queensland Police Service and Queensland Work Place Health and Safety Department investigating a quad rollover accident at the Resort and our commitment in increasing safety at the resort when possible. The Resorts Workplace Health and Safety Officer was also concerned with minor quad rollovers and the safety of guests whilst on the berms around our sand quad tracks. Our problem being that even though we operate all tours at slow speeds, 15kph maximum speed on fine and soft sand tracks, we had a few instances wherein guests sustained additional injury due to quads rolling on top of them. After having an initial meeting with Mr Robertson and trialling an engineer designed and approved quad bar from QB Industries, the Resort conducted a Risk Assessment and Safety Audit. This audit concluded that at low speeds, the quad bar prevented the quad from continuing to roll over onto guests and prevented injuries to the guests in almost all incidences. The Resort was so impressed with the quad bars design and ability ot reduce injuries in our situation that we worked with Mr Robertson and gave him a 90cc quad bike to assist in the engineering process to have a quad bar fitted to all 50cc, 90cc, 250cc and 400cc Quad Tour ATV's at the Resort. We estimate that fitting quad bars to all quad tour bikes has reduced our accident injuries by 80%. This is simply because the ROP once fitted, stops the quad from rolling onto the guest if they tip it over on its side. Additionally, by fitting the ROPs, it has reduced the amount of damage and maintenance cost to brake levers, mirrors, gear levers, etc..."
"Just a note to tell you that I fitted a quad bar to my bike only a month ago (purchased 24/8/11). Last Saturday I managed to reverse (thought I was in a forward gear) over a sheer bank into a small creek landed on my back on the other side of the creek with bike not having flipped but landing on its side in the creek. There is no question that the quad bar has saved me from a serious injury, but more probably my life! Not only that no damage to the bike. Just a bit of a tear on the sponge rubber. Yesterday I went to see an old mate who is home for a week from Burwood after six months wheelchair bound, and likely to be for the rest of his life, due to a pretty simple roll over, and I asked him if he had any sort of roll bar. The answer was of course no but that if he had had he wouldn't be in a wheel chair today! I can't thank you enough for bringing these into the country and even though I complained at the time about the price when you consider the ease of fitting compared to mounting a bar on the frame it becomes very reasonable"
Need to buy Lotto ticket!! 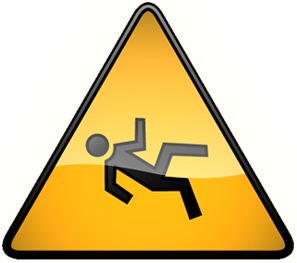 "...As an All Terrain Vehicle Instructor I know the injuries that can occur as a result of a quad roll over or flip. After viewing the demo videos on the company web site on how the quad bar can function, it appears this device offers the rider a fair chance of surviving serious injury. I did acquire a quad bar in the spring of 2014 in time for the ATV training season. There were many interested people not only at the ATV courses but also those that I met while riding on the trails. 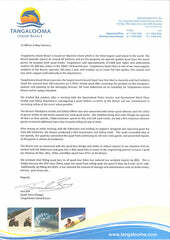 I was glad to answer their questions and they indicated they would go the website for more information. The quad I have is a working quad in that I have boxes on the machine for carrying things. I also pull a trailer with a water tank on it for watering my horses. The quad bar I have is attached to the back luggage rack and the toe bar between the back wheels of the quad. I can turn corners with trailer and back up and the bar does not interfere with either operation. I can also open or close the back box lid without the bar getting in the way. The configuration of the bar and the way it attaches to the quad looks like it will fit many different makes and models of quads which show it’s versatile. I ride my quad on some very rough terrain at times. I am glad I have a quad bar mounted on the quad and I wouldn’t be without it. This crush protection device deserves some serious consideration for any riding enthusiast."